Curt Schilling tipped his cap to the Fenway crowd on Oct. 25, 2007, after leaving Game 2 of the World Series. He is on the Hall of Fame ballot this year. Discuss: Who would get your Hall of Fame vote? In other words, I voted for very good players named Morris, Raines, Trammell, and Schilling while not voting for slam-dunk greats Barry Bonds, Roger Clemens, Sammy Sosa, Mike Piazza, Jeff Bagwell, Rafael Palmeiro, and Mark Mc­Gwire. I did not vote for Obvious-But-Probably-Dirty Superstars. Instead, I voted for the Better-Than-Ordinary-But-Clean . . . I Think. I’m betting nobody gets in this year on this ballot. And it’s going to cause a bleepstorm. There’s a lot of other stuff inside the envelope, but none of it matters much if we apply the characterizations stipulated in Rule 5. It would be truly convenient and easy if this clause were not part of the ballot. But it’s there. It has been part of the process since the beginning. Consider, for a moment, the voting body in this election. Sportswriters. I don’t know about you, but personally I can’t think of any group in the world less qualified to pass judgment on folks’ “integrity, sportsmanship, and character’’ than a pack of sportswriters. Nuf Ced, right? Unfortunately, we are stuck with this charge. Individually, we choose to either ignore the clause or interpret it to our best satisfaction. Which is wildly unsatisfactory. To everyone. The history, rules, and evolution of baseball, coupled with the “character” clause of Rule 5, have made it virtually impossible for any voter to maintain consistency with his ballot. 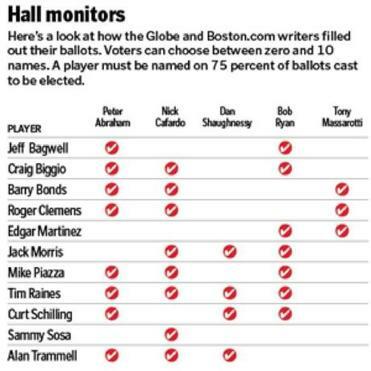 The good news is that Hall of Fame voting is not a court of law. We can make bad or good judgments based on whim, instinct, data, or gut feeling. In this spirit, I have chosen to ignore the proven cheaters until further notice. If you failed a drug test, or admit to PED usage, you don’t get my vote. In addition — even more unfair — you don’t get my vote if you look dirty. This is how I manage to not vote for the likes of Piazza and Bagwell, two guys with no admissions or evidence against them. They just don’t look right. Players who come up short of the 75 percent required for election can stay on the ballot for as many as 15 years. I have never been one to “withhold” a worthy candidate, just to make him wait. But the 15-year rule provides some comfort to those of us who might learn more or change our views on PEDs. Some voters believe that it’s OK if you cheat if you demonstrated that you were a Hall of Famer before you went on the juice. This is how some voters justify voting for Bonds or Clemens, two players who established HOF greatness before they morphed into Macy’s Parade characters. I don’t buy it. If you cheat only on the back nine at the Leo J. Martin, you are still disqualified. We’re supposed to be sending some kind of message to the next generation, and I don’t like the message that it’s OK to rig the playing field. Sorry. Can’t buy that one. I don’t believe it was everybody. Which brings us to Messrs. Morris, Raines, Trammell, and Schilling. Morris won 254 games and pitched the 1-0, 10-inning Game 7 winner vs. the Braves in the 1991 World Series. He got 66 percent of the vote last year and has a chance to be the only guy elected this year. What hurts him today is the nitwit notion of the sun-starved Bill James Army, which contends that wins mean nothing. In my view, Morris is a borderline candidate, but Hall-worthy. I have never before voted for Raines or Trammell, but I’m doing it this year as kind of a Roids Backlash. Raines was a switch-hitting speedster who won a batting title, stole 808 bases, and scored 100 runs in a season six times. He had a little pop (170 homers), too. Trammell hit .300 seven times, won four Gold Gloves, and should have been MVP in 1987. Raines and Trammell are borderline at best. But this year they get my vote. Finally, we have Schill, making his first appearance on the ballot. This is a tough one. His win total (216) is not great for a Hall of Fame starter. He was an average pitcher over the first half of his career. Sure, he has great postseason numbers, but like Bernie Williams, Schilling had more chances to play in the postseason than players from earlier eras. Schill’s résumé is only slightly better than that of David Wells, who doesn’t stand a chance. And let’s not forget that Schilling was an insufferable blowhard. All that said, he gets the nod. He ranks 15th all-time in strikeouts, his winning percentage (.597) is Hall-worthy, and the 11-2 postseason record speaks for itself (always better than letting Schill talk). I didn’t want to let my personal feelings for a player get in the way (hello, Jim Rice). So perhaps I gave Schilling the nod because I don’t like him — defusing the ever-handy charge that we use our vote to take out grudges against players who were uncooperative. The elections of Steve Carlton and Eddie Murray should have put that to rest. The Schilling argument would have been fun in a simpler time — back when we argued about baseball abilities, numbers, and comparisons with people already in the Hall. But now we are in the business of cherry-picking the cheaters. And it’s unfair. And awful. So I held my nose and put the ballot in the mailbox.